originally uploaded by Jeevan Kumar. The ship that was designed like the 18th century’s submerged ship, Sweden’s Gotheborg is arriving chennai tomorrow (31st January). The 18th century’s Gotheborg ship that floats on the sea was shining as a biggest cargo ship that belongs to Sweden. Not only through the trade, even Gotheborg was served to improve the culture and it also holds all miscellaneous art structures and display as a vault. This ship was involved in an accident and submerged in September1745, when it was carrying Tea and Porcelain things from China. After that Sweden started to design a ship like Gotheborg. As per Gothperk ship was designed from 1986 to 1992 with most antique objects and by the time it provides modern facilities and security lay outs. Gotheborg that got life again, looks like the mast ship that comes in the old Tamil film Aairathil Oruvan. We can tell this ship displays the same style with little modernization. Gotheborg, which horrific at many people whom eagerly seen in many countries, was going to rob our (people of chennai) eyes from tomorrow. Sweden’s Gotheborg has comes by passing five continents; after traveling through Spain, Brazil, Australia, it departed from Singapore on 14th and reach chennai harbor on 31st after its 15-day travel. This ship would be welcomed by governor SS Barnala, Sweden deputy PM Mautolopsun and ship minister T.R.Balu. The ship is expected to stay in chennai for 11 days. What special about it is, Gotheborg is only coming to chennai in India. From where ever this ship depart, it has a familiar to carry a group of people from the harbor, as per it has actor Revathi, Leptin commander Amit Arvind, tsunami affected fisher men, 2 journalist who were traveling in the ship would involve in cleaning it. As Gotheborg coming to chennai, a festival called “Sweden comes to Chennai” was going to celebrate for 10 days; that time special programs by Sweden will hold. On Feb 1 a trade program is going to hold and both nations like to discuss on varies department. Continuing that, every day a special program like Jazz musical’s Minta music program, Sweden’s food festival, film festival would be held. Public can view this ship from Feb 3rd -7th from 1 to 9pm. 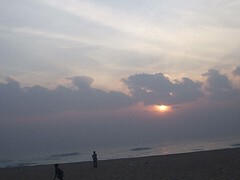 We can also see this sight from Marina beach. 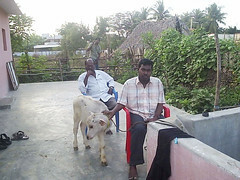 In the recent Pongal days, the most I enjoyed one was Mattu pongal, which I spent in my mom’s aunty village. After my grandpa left all his bulls, years back we dint get change to celebrate the Mattu Pongal. 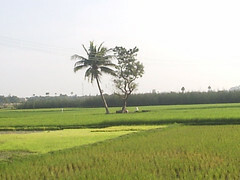 Nowadays my thoughts, interest and wishes on villages and farming have increased, so that would be the reason for me to visit the village on mattu pongal day. I think its not only the farmers to celebrate this mattu pongal, every one who eats rice from the paddy should also celebrate the mattu pongal to thank the cattle’s for their handworks on the earth. Its wonder u know to see a village with green fields, with cattle’s and still alive in the same position till now as I see from years. 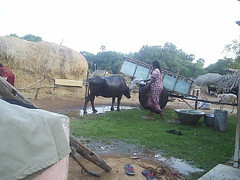 When it was few km’s from Chennai, when the surrounding places are changing as Engineering collages and IT parks. It was mid afternoon, when we drive in the dusty old mahabalipuram road in the hot sun. 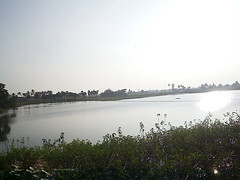 This village is near Thiruporur, one side it was ex-salt pan areas, unfitted for agriculture, and the other side has good soil and water facilities. Mostly we visit to this village in summer times, so the lake would be dry with little water, but to my surprise the lake was filled with water and buffaloes were swimming. 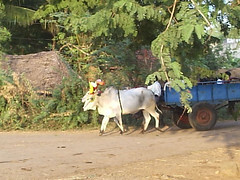 When we arrive, the people in the village were preparing their bulls for the Mattu Pongal, with colorful paintings on their horns and the bull carts, with balloons hanging. We spend some times in the fields; the green field was a beautiful scene to adore and the water from the pump set was great. It’s my wish to celebrate the Pongal in the traditional way, even though we had no way to bring the old style of the pongal, which celebrates, in village sides. 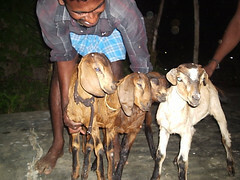 This year we (Tamil Nadu) faced a new equality pongal with out seeing the religions all were gather and celebrate. 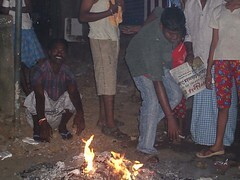 As I said in my recent post most people in cities use the other vessels than sand pot to cook pongal. I had a point that I should not give it, so urged my parents to buy a new sand pot for the pongal, even though we had a old pot, I needed only new ones. 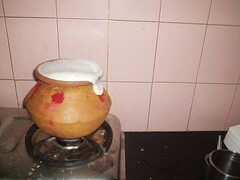 Wake up early to do not miss the special programs on TV; the pongal was over flowing from the Pot when the sun was on the top, rushed to click a snap of it. Placing the pot in the center of the kolam on the opened gateway, it naturally took us to the traditional way, when we showing the camphor adoration to the pongal pot, and the sun; shouting Pongalo Pongal was very warm that we had a best one forever. 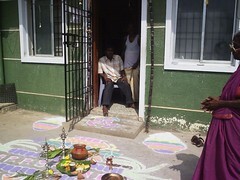 We also got some support from a neighbor for the equality pongal. The best wishes would be from them, as they feel happy by the way we celebrate it and we also shared the sweets and pongal with them. I felt that in my apartment most don’t likes to share the festivals or the enjoyment with others, except some whom like the one who comes forward interestedly to share the pongal. Now I really miss my old neighbors in my old place who are even ready to put love fight with us for their share in our pongal. How sweet it was!! The place was very silent, only parents, my grandma and me were presented to worship the sun. My bro was off from this as he was wandering with his friends for the first day ticket for new release films. Even thought it was bore time, I was happy that we are celebrating our festival in good mood. Above is my Pongal Pot, which I did two days back with cotton, painting the pot and the paper karumbu (sugar cane), was kept in our showcase. 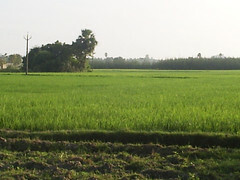 Thai Pongal(boiling) was a traditional festival of Tamilan’s, which flows (celebrated) during the first four days of Thai Month (mid-January) according to Tamil calendar. 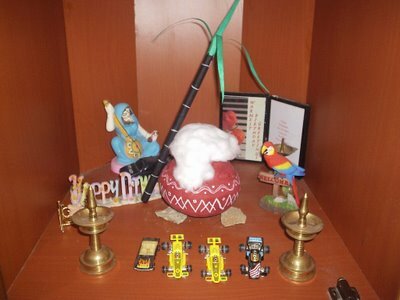 Each day refers a special and it calls as Bhogi, Pongal, Mattu (bull) Pongal & Kaanum Pongal. This was my favorite festival always. This was the day we used to thank the Nature, and we can also call this day a new year for our farmers. After the yearlong hard works of plough the soil to make it a good one for cultivate; then seeding the paddy; transplant in to another spacious place and leaving water till it reaches the stage of Harvest, the farmers spent there whole energies to see their paddy are grown well. 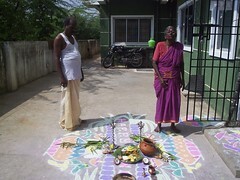 So to express their happiness by thanking the god they celebrate this Pongal. 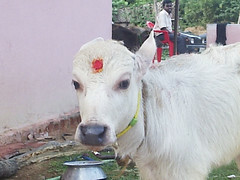 The Mattu Pongal is the day to thank the cattle’s, esp. the bulls that helps us to the agriculture. 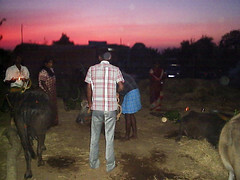 We not only take the energy of bulls, even their dung’s are used for this pongal festival. 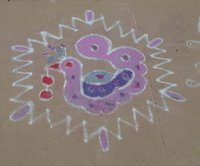 As it was the Thai first, the next month of the Margazi which was the season for kolam (making a design with rice flour). On this time and on pongal days people used the dissolved bull dung to create a smear before their gateway to draw the kolam. Now days we can only see this smears in the villages of Tamil Nadu, once it was also available to see the smears in chennai some years back. 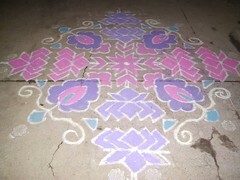 The kolam gets an exquisite when it was put on dung smear floor in rice flour. 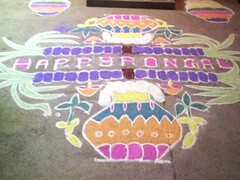 And it considered auspicious to make the kolams before sunrise, as the Sun God feels welcome before it visit the earth. 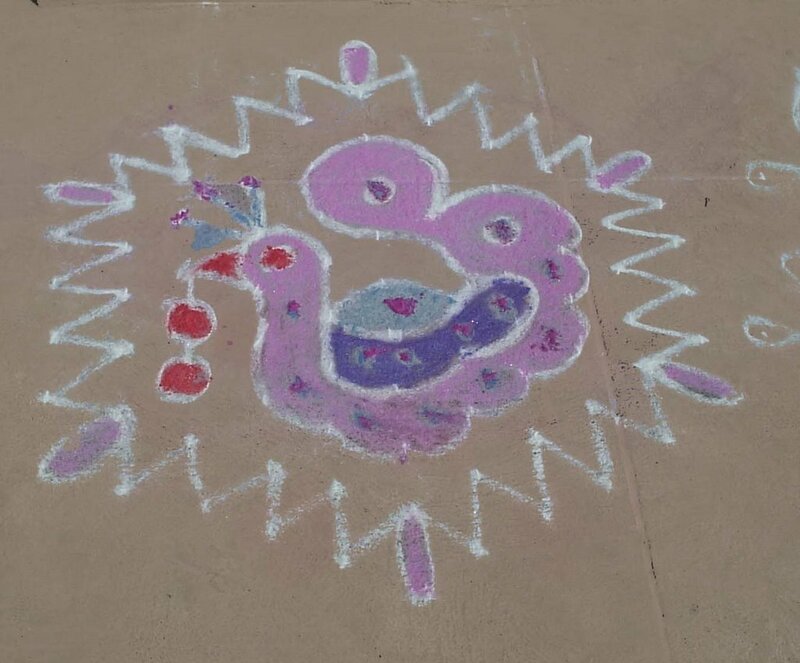 To bring more attracts to the kolam, a lump of cow dung will places at the center of the kolam and a five petal pumpkin flower will rests on it regarded as a symbol of fertility and an offering of love to the deity. 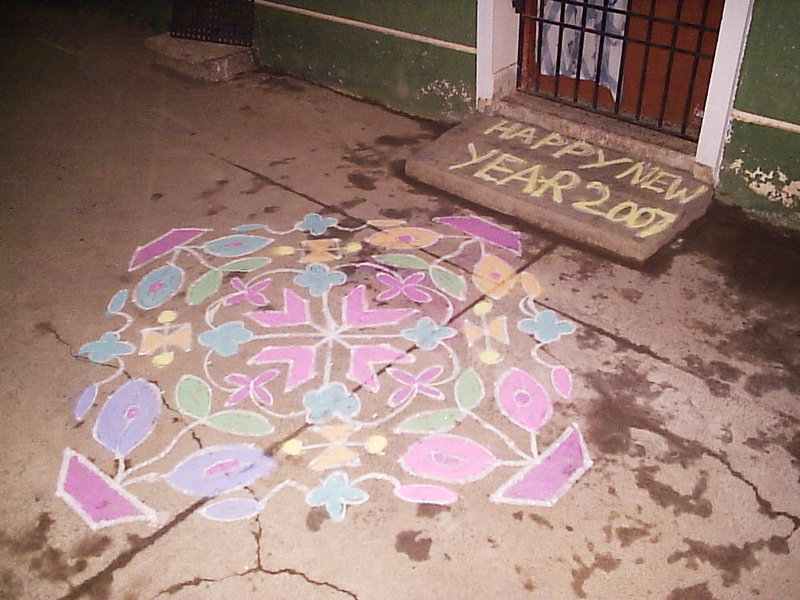 I have seen some of these incidents near my house at least before 10 years back, the friendly neighbors used to follow this way of putting kolam, some times their would be little fight with others for the bull dung. 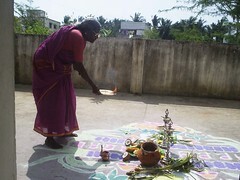 On the day of Bhogi I noticed many people come to my grandpa house to collect the dung for putting kolam. 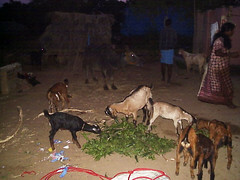 As we are in the Margazi season, the gateway of my neighbor’s friend’s house would have a thick dung smear floor and as it would be very smooth and our evening hours of sitting, playing and talking with friends will be on that floor, some times even we get scold from the neighbors for braking the dung floor, esp. for leaving tops on that. We did we did…. 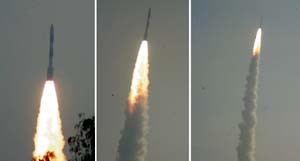 Today, Indian space technology saw a milestone in its history by the successfully launch of Polar Satellite Launch Vehicle (PSLV-C7) carrying four satellites at a time to the space, after the lost of India's Geosynchronous Satellite Launch Vehicle (GSLV-F02), on INSAT-4C Mission last year. In a small island Sriharikota, off the Andhra Pradesh coast, with the backdrop of the shallow backwaters of the Pulicat Lake and the morning clean sky, gave way to the PSLV-C7 to lift off from the first launch pad at 9.23am. In the first time of History India launches 4 satellites, India’s CARTOSAT-2 and Space capsule Recovery Experiment (SRE-1), Indonesia’s LAPAN-TUBSAT and Argentina’s PEHUENSAT-1 into a 635 km high polar orbit. The four satellites have been placed in a polar orbit at an altitude of 637 km with an inclination of 97.9 deg with respect to the equator. The 44meter tall PSLV has a lift-off mass of 295 tonne. This is the 10th successful flight so far, since 1994. CARTOSAT-2, the twelfth in the Indian Remote Sensing satellite series, is an advanced remote sensing satellite capable of providing scene-specific spot imagery. It will join the other six IRS satellites, which are in service. It carries a panchromatic camera to provide imageries with a spatial resolution of better than one meter and a swath of 9.6 km. The data from the satellite will be used for cartographic applications at cadastral level, urban and rural infrastructure development and management, as well as applications in land information system and geographical information system. For the First time, India test the Space capsule Recovery Experiment (SRE-1), developed by ISRO’s with 550 kg capsule, intended to demonstrate the technology of an orbiting platform for performing experiments in microgravity conditions that takes India into an elite club of countries that have satellite re-entry technology. This SRI-1 will stay in orbit for between 13 to 30 days and is expected to splash down into the Bay of Bengal for recovery. SRE-1 mission will provide valuable experience in such important fields like navigation, guidance and control during the re-entry phase. Two days before de-orbiting, it will place in a Repetitive Elliptical Orbit. Subsequently, it will be reoriented and deboost rocket is fired to make it reenter the earth’s atmosphere. Close loop guidance system is employed during deboost and coasting phases leading to its recovery. On re-entry, after initial aerodynamic braking, a parachute system will reduce the touch down velocity and will splashdown in the Bay of Bengal, east of Sriharikota coast. A floatation system will keep SRE afloat and enables its recovery. From this success, India becomes the 4th developed country in Space Technology after the fore front countries of U.S., Russia and China. We have to be proud about our scientists. I congrats and wish them to success in each and every plans. Sania Mirza the Tennis storm of India that was weaker last year has waked up in a new robust and velocity by beating the fourth seed Maria Kirilenko in the first round of the Moorilla Hobart International tennis tournament by her first win to kicked off her 2007 season on a confident note. Sania, who entered the singles main draw as a wildcard, ousted world No. 29 Maria Kirilenko to advance the second round on the WTA Tour. The young Indian Icon, who was right now in Australia, was very circumspect about her preparation for this year. Playing in the Asian Hopman cup in India, the Asian Games has meant that her off-season was considerably reduced. She tried to use this as best in working on physical fitness and few more things to the game. Silver medal in Qatar Asian Games 2006 Women's singles final and gold medal in mixed doubles partnering with Leander Paes brings her some hopes and losing to fore front players Martina Hingis in the Kolkata open, Svetlana Kuznetsova and Nadia Petrova are some of her best memorable times in 2006 for the 66th rank holder. Let it be a learning year for the Sania, who was more complete player than two years ago, although she still have a long way to go. I Wish Sania a wonderful and much achievable year!! the shaking red flowers near my gold house. 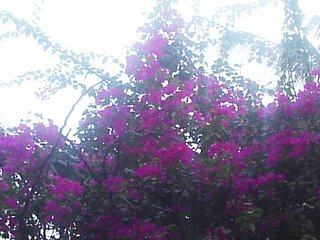 with my fav pink color flowers,. deceit by being dry branches. Picking the loves once left to sea. blessed to park near some good-looking gals. A feeling of entered into an exhibition. Think like boy would sit quite and listen to music. Who know? Why I visit shore often! Just got to sight some gals. and guys to adore them. a cool walk with her. With little smile in my mind, left the place. Munbe Vaa En Anba Vaa… from Sillunu Oru Kaadhal was my most favorite song of the year. Gorgeous voice of Shreya Ghoshal was very attracted me to this song! And naresh’s voice was a good pair to it. The soft melodic and romantic tune, which creates a happy feel by Rahman would be a best of the year. The video of this song was another pleasant one with Boomika’s adoring cheek cavity smile, and the drizzling background. 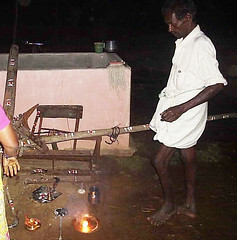 Manjal Veyil Malaiela…. 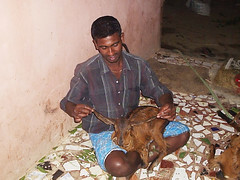 from Vettaiyaadu Vilaiyaadu. The songs stats by vennilava velli velli nelava… first felt it would be a soft melody, after few seconds that totally turns to western music, was energetic. It was an enjoyable song from Hariharan after some time. I too have imagine this song like the yellow lights of the sun by the time its 4.30 to 5.pm it flashes through the groups of trees as the green and ripe leaves spill on the ground the people walking in that. I just wonder by the video of clean picturesque of this song, and the background lights are amazing esp. the black sky change as blue and orange colors are so different; the dream city of New York was pleasant to see, actually I expected this type of video for New York nagam song form SOK. Poet Tamarai’s lyrics were beautiful. Un Parvayil Paithiyam anean… form Something Something is a sweet romantic song. It starts with a slow guitar tune and the guitar plays a nice work throughout the song, my fav Karthik singed it well with fast & slow which fits the music. The picture of this song was a cute one, Trisha smile is what I liked much. Yedhedho Ennangal Vanthu…. from Pattiyal is a sweet melody which welfare and relax my mind from Yuvan’s wonderful music. Yuvan also tries his voice and it too comes out in an adorable manner. Here was another cute one, which have nice dance movements from Bharath and Pooja. Pakaatha Enna Pakaatha… from Aaru was a song, which was singed, in a sad situation when the hero wound his girls mind and feels her love memories. Devi Sri Prasad’s slow music and Tippu’s voice makes a warm sense. Trisha in a sari with open hair looks so nice, it craves me to watch it again & again. Idhu Enna Pudhu Unarvo….. form Chitiram Peasuthadi. Like the lyrics, it gives me a new feeling whenever I enjoy this song, which runs less than 2 minutes. Manju Haridas gives voice to this, as new Music Director Sundar C. Babu, set by tune for this film were all songs are super hits. When I was alone I like to listen to this songs, and it brings a refresh inside me. Dhavanipotta Deepavali… in the film Sandai Kozhi is folk with classic music by Yuvan is gives a familiar feel. The voice of Vijay Yesudas was a good choice. Meera Jasmine’s prank acting was an additional pulse, sits me to adore it. Boomiku Velichamelam… from Dishoom was poetic style of song; which attracts me here is the matured voice of Gayathri great voice loved it. I liked this song at first time listen it in radio; it ‘s really a different one. Vijay Anthony brings a romantic style of tunes, to this Hot Song! Aah Adi va… form Imsai Arasan. It should be appreciated to see the brave of composers to set tune of 50’s and 60’s in this time of modern style of music. The good thing was its not a remake song, it has its original lyrics in 50’s tune. The second half of the female voice given to this song was soothing, I keep on repeating the second half much times. Sabesh & Murali these two hands created a respect for the old songs in our young’s. Here comes another fav Hoty song from Vattraram, Mudhal Mudhala… in the way of an englsih song with the instruments that bring some peppy beats for the romantic lyrics. This year I have been attracted by some female voice, on the list here is another its Janani, sweet voice!! This song was picturesque in the backdrop of a beach side resort, with arya and keerat in colorful costumes. Chitheraiyil Enna Varum…. With pure Tamil lyrics from Sivappathigaram was the best one for Tamil lovers like me. I adore the lyrics, with very soft music, but it has some beats that disturb the beautiful pronunciation of the lyrics by Swarnalatha. Veyyilodu Vilayadi Veyyilodu Uravadi…. 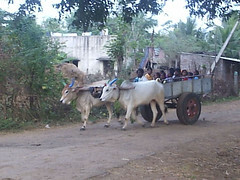 From Veyyil was a beautiful song with the countryside children’s fun in the Sunshine. The lyrics, the children’s activities take us to our childhood memories. Another song from the same album is Kadhal Nerupin Nadanam... was a bright duet, which took in short and cross streets in south Tamil Nadu. The song has an art in the picturesque and the lyrics. This year there was also some mass song in my likes. The Asai Dhosai... song from Paramasivan was one among in the list. I listen to this first time in SunTv’s Supthasurangal where a kid sings, after that I was searching for this song, and found, it was from paramasivan. The voice of Priya Subramani was a very different and gusto, it really rocks. Have seen the video twice, it is an item dance in prison. I also adore a remake song this year; it’s the Ennadi Muniyamma... from Vathiyar and there are many film songs I have enjoyed this year, but I can’t written all here. Last year we had nice songs to adore, it can be peppy, melody. Rap, remake or anything. Even, year-end also we listen to the new release album, which would be good songs for 2007. Wish to listen more good songs in this year. Had a little celebration with family on the New Year night. Some cousins come in the evening and went before we cut cake to welcome the year. I expected them to be with me, esp. it would be nice time if my sister present on the night. 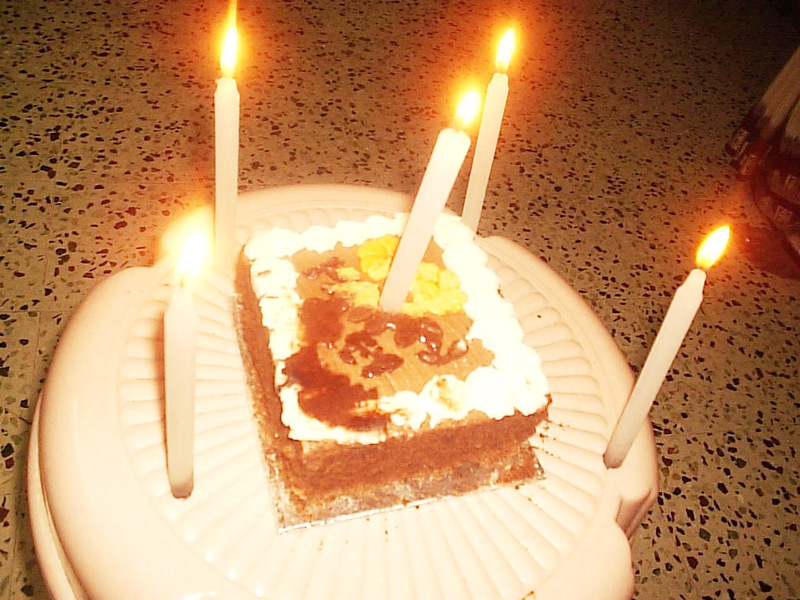 My lovely cousin and me cut the cake and said happy New Year;got wishes from friends and relatives. The New Year day was nothing special, just view the televisions. I like the show of Dream girl 2007, most of them prefer for actor Asin, but I think Shirya would be the top actress of the year, as she paired with Super Star, but my wishes is Trisha should be the dream girl of the year:D. let me know whom do u prefer as dream girl 2007? 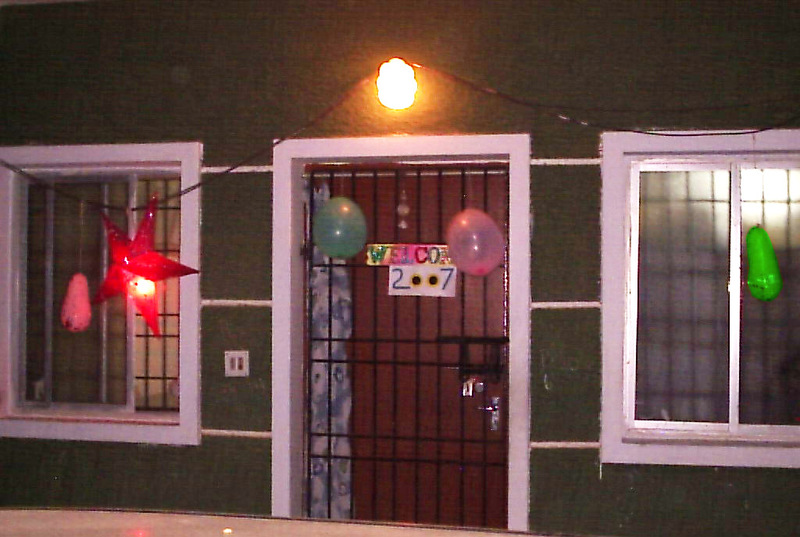 Last year the flat mates celebrates the New Year on the terrace, as we were new that time, they dint invite us, this time non-were celebrated and many were left some were. Next time I wish to spent the New Year night in beaches to have fun by watching others celebrations and firework on the sky. Last week and year-end was not normal, it’s very shocking and felt cruel. 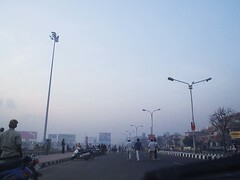 The chennai was shocked when police found an 11-year-old kid’s body from bushy place on Wednesday. Some unknown kidnapped Aravind who was in his 6th, two days before his body was found with cut fell on his face. In the enquiry comes the secret behind the killing of Aravind, which was unbelievable. 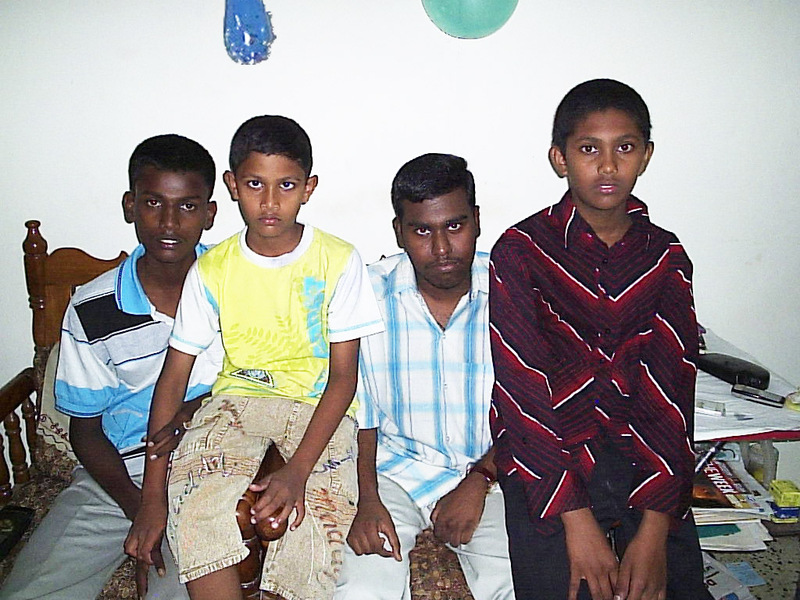 Its 3 kids below 18 were arrested on Friday for kidnapping and killing him cruelly. The reason said by police was the 3 kids whom were 16 and 15 kidnapped the boy to demand his parents 5 lakhs to celebrate the New Year and buy cell phones. 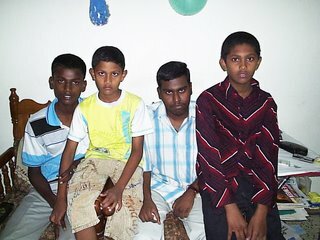 What really make shock are these 3 kids were best friend of Aravind. Now there futures were questioned? The three were in the prison and the enquiry continues… before it end’s here comes another cruel which shakes the whole nation. It’s a long time complains that many children’s in Nethari village of Noida (Uttar Pradesh) were missing for last three years. But non-can’t find where they gone, and complaints were registered in police. Some days back the people in the village Odours a corpse smell from the drainage canal, when the police dig the roadside canal they found many bones, and organs of young children. Totally 30 decomposed organs and bodies of children were captured and sent to postmodern. These bodies were captured outside the compound of a businessman Mohinder Singh Pandher house. The police have arrested him and enquired about the children and he accepts that he only rapping and killings the children and throw it in the canal. This incident has marked the country very flurry. The people and relatives who lose their children are in angry and they protest and destroy the Mohinder’s house, the village was flurry and every day there was violence breaking the police were heap for security. See where our country is going…. Our futures are killed for sexual abuse. The sleeping govt. should be fast on this case and the accused should be punishes severely. Where this village was protesting for the killing of innocent children. The world is protesting for Saddam’s capital punishment. The American army, which captured the Iraq in 2003 on war, removed the Saddam’s government and brings the nation to its control. There after the country faces bad times of continues suicide bomb blast, every day violent, lose of lives has become normal. In this time US found Saddam from a pit and brought the old cases on him to investigate. With the favour of opposite religious parties the US also brings a new government, which was under the control of US (I think). In the month’s long investigation the Iraq court gives him capital punishment for killing 148 Shiya people in 1982. The punishment was conformed by special court on Nov 26th and he was handover to the Iraq government. 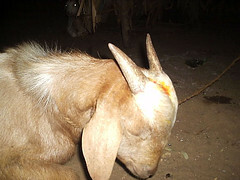 In the situation of Bakrid, all hoped that he would not be put under the rope, but in the unexpected time they hanged him early morning on 30th Dec. This news very shocking to every one, with in minutes the Iraq started to faces continues of bomb blast and violent to its high. When the news spreads many people contempt the US cruel act and many places had protest and violence. I too think it’s an urgent decision by US govt. and the investigation has not done properly on the case and the only aim of the cases is to hang him. What happen now nothing has changed except the increased violence, I think the capital punishment should not be given to him; he is a President to million people. Why the US had war on Iraq? To find the deadly weapons. Did they found? Non. The purpose of the war is to destroy Saddam’s power and kill. Why do we need an UN security counsel when they are useless where there are million peoples were dieing. The US should be controlled; it’s a cruelty! Let Saddam’s soul get peace in the heaven. We all hope and pray at least in this year the violence and cruel acts against human and all livings should be decrease. ## Today morning I read a news that a child from Islamabad was hanged by itself while playing like hanging, after seeing the Saddam’s punishment on the Television. See how the punishment has pressed in the kids mind. The channels should try to avoid these scenes on vision!